This space wallpaper from the MPG/ESO 2.2-metre telescope at ESO’s La Silla Observatory in Chile shows a contrasting pair of galaxies: NGC 1316, and its smaller companion NGC 1317 (right). This space wallpaper from the MPG/ESO 2.2-metre telescope at ESO’s La Silla Observatory in Chile shows a contrasting pair of galaxies: NGC 1316, and its smaller companion NGC 1317 (right). 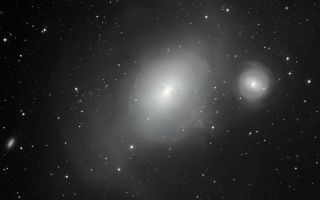 Although NGC 1317 seems to have had a peaceful existence, its larger neighbor bears the scars of earlier mergers with other galaxies. This image was released April 2, 2014.